Inspired and led by the Honorable Minister Louis Farrakhan, more than a million Black men gathered in Washington, D.C. to declare their right to justice to atone for their failure as men and to accept responsibility as the family head. 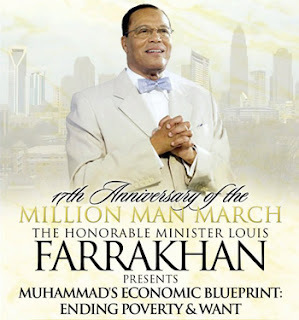 This year's anniversary celebration will be observed in Charlotte, North Carolina on October 14, 2012. Minister Farrakhan's keynote address is titled "Muhammad's Economic Blueprint: Ending Poverty and Want" at the Bojangles Coliseum. This message will come in Charlotte weeks after President Barack Obama accepted the Democratic nomination in that same city. Minister Farrakhan's message will also come weeks before the November election. North Carolina is considered a battleground state. However, Minister Farrakhan will be addressing something that has been omitted from the platform of both parties: The Poor. Do you know the history of the Million Man March? I was in high school then. On that day, Monday, October 16, 1995 there was a sea of Black men, many who stood for 10 hours or more sharing, learning, listening, fasting, hugging, crying, laughing, and praying. The day produced a spirit of brotherhood, love, and unity like never before experienced among Black men in America. All creeds and classes were present: Christians, Muslims, Hebrews, Agnostics, nationalists, pan-Africanists, civil rights organizations, fraternal organizations, rich, poor, celebrities and people from nearly every organization, profession and walk of life were present. It was a day of atonement, reconciliation and responsibility. Congress shut down that day and President William Clinton was "out of town." Mainstream media in American and media outlets from around the world were watching. The world did not see thieves, criminals and savages as usually portrayed through mainstream music, movies and other forms of media; on that day, the world saw a vastly different picture of the Black man in America. The world saw Black men demonstrating the willingness to shoulder the responsibility of improving themselves and the community. There was neither one fight nor one arrest that day. There was no smoking or drinking. The Washington Mall, where the March was held, was left as clean as it was found. Two of the best descriptions of the Million Man March include the word "miracle" and the phrase "a glimpse of heaven." Peace to you. Bro. Jesse. Nice writing. The youtube video that you have posted with this article is no longer available.